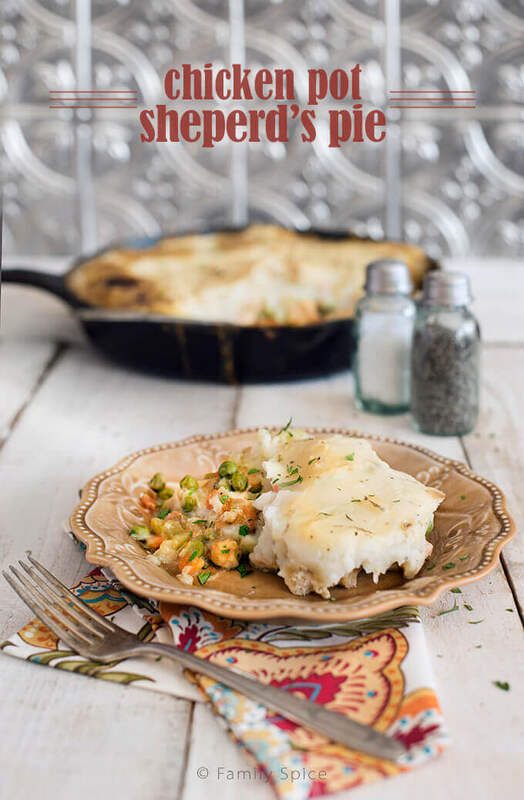 This Chicken Pot Sheperd’s Pie is a fusion of two classic, family friendly meals: Sheperd’s Pie and Chicken Pot Pie. Sponsored by Idaho Potato Commission. When my husband and I had our first child, we found ourselves in a new city, looking for a new house. My husband had begun a new job and I moved down from Los Angeles to join him… when my baby boy was only 2 weeks old. What was I thinking? Packing and moving with a newborn?! I was a first-time mom and I was delirious from lack of sleep. Boxes took forever to get unpacked. The house was empty and expensive. We lived paycheck to paycheck those first few years in San Diego. And I learned quickly how to live on a super tight budget. So when the Idaho Potato Commission asked me to develop four recipes using a 10-pound bag of Idaho Potatoes that would feed a family of four for $25 or less, I was up for the challenge. Today’s post is one of these four budget-friendly recipes. It was also the cheapest meal, with ingredients costing totaling $3.98 (not including staple items like spices, oil and flour). Yup, $4 to feed a family of 4. And that’s 4 hearty servings of Chicken Pot Sheperd’s Pie. No one is going hungry after this meal! But before I share the recipe, I want to share you my tips on how save money at the grocery store, and how I was able to make a meal, costing $1 per serving. First and foremost, is to become a savvy shopper and shop sales. There are multiple of grocery stores to choose from, from major chains to small ethnic markets. Learn to read the weekly circulars and control those impulse purchases. Buy shopping this way, I was able to buy a 10-lb bag of Idaho Potatoes from my middle eastern market for only $2.79 and boneless chicken breast for only $1.49/pound at a major grocery store. So, shop what’s on sale and stock up! When meat is marked down, I buy a lot, use what I need and freeze the rest. The second way to save money, is to make your own meals. Not only is processed food expensive, it tastes terrible and is ridiculously unhealthy for you. Making your meals from scratch may sound like a horrible task, but you will save money in the long run. 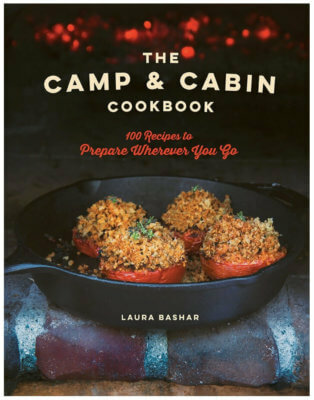 And you might surprise yourself with your cooking skills! My last tip piggy backs on tip #2: get creative in the kitchen. Maybe you can’t afford all the ingredients in some fancy schmancy recipe, come up with less expensive alternatives. Getting creative also works when trying to save time on the cooking and preparation. Which brings us to my Chicken Pot Sheperd’s Pie. I got a little creative. While thinking about the numerous meals I can make with Idaho Potatoes, I thought about the classic Sheperd’s Pie. I had never made it before, and honestly, after looking at the recipe, I knew my family wouldn’t be too excited about it. So I pushed that idea aside. A few days later, out of the blue, Middle Child asked me if I could make chicken pot pie. He was curious because I had never made it for him before. It got me thinking. I was still working on potato recipes. No potatoes in the traditional chicken pot pie, so I decided to make my own version, like this Chicken Pot Sheperd’s Pie. 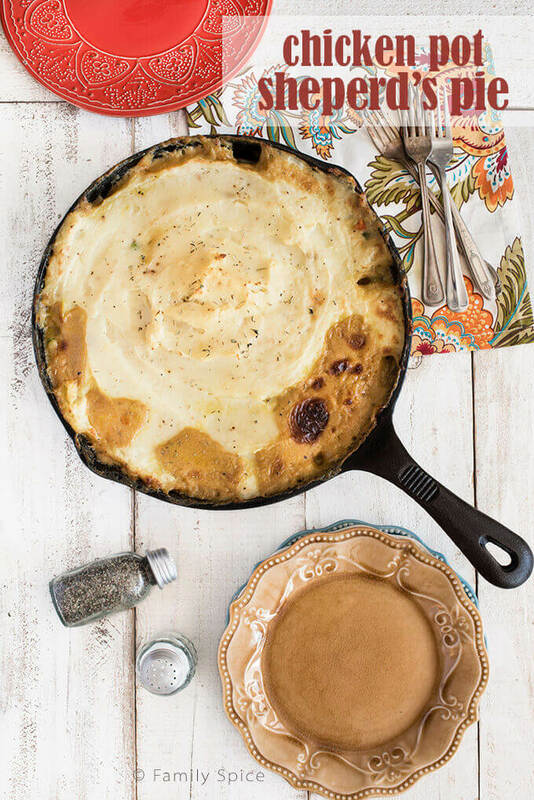 Although the potatoes are boiled in a second pot, everything else is cooked in a cast iron skillet. If you don’t have an oven-safe pan, you can also cook it in a regular pan and bake everything in a casserole dish. 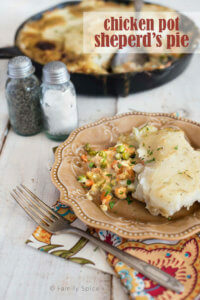 The creamy chicken and vegetables lay on the bottom of the pan and are covered with a fluffy layer of mashed potatoes. This is serious comfort food. And I think I got 6-servings with this recipe. It just depends how hungry you are! I hope you like it and stay tuned for the remaining recipes I created for the Idaho Potato Commission for their 4 meals/4 servings/$25 promotion. 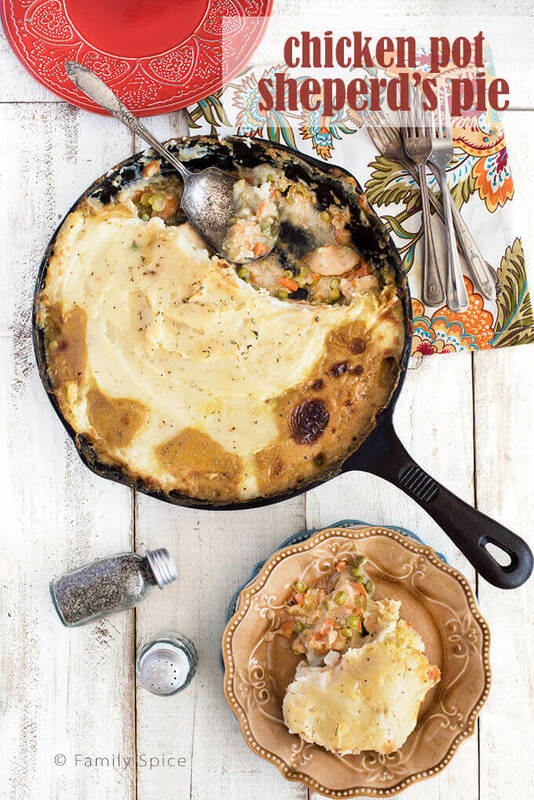 This Chicken Pot Sheperd's Pie is a fusion of two classic, family friendly meals: Sheperd's Pie and Chicken Pot Pie. Cover potatoes with water. Bring to boil and continue cooking until potatoes are fork tender, about 15-20 minutes. Once cooked, drain water and return pot full of cooked potatoes to the stove. Using a hand masher, mash potatoes until all ingredients are incorporated and mashed potatoes are smooth. Set potatoes aside. Stir and cook until flour is incorporated. Cook until mixture is thick. Remove from heat. oven until bubbly and golden, 20-30 minutes. Sorry about that! My mistake. The recipe is up now. Hope you like it! I’ve enjoyed your recipes. But this one is truly unique. No recipe!! The box that should contain the recipe is blank. Please correct! Ack! Sorry about that. My post published a wee bit early. It’s all fixed now. Thanks for letting me know and I hope you like it! My family would just love this! Pinning for dinner this weekend! I just love this!! I much prefer chicken over every other meat and this is an awesome twist on a traditional Shepherd’s Pie! Yummy!